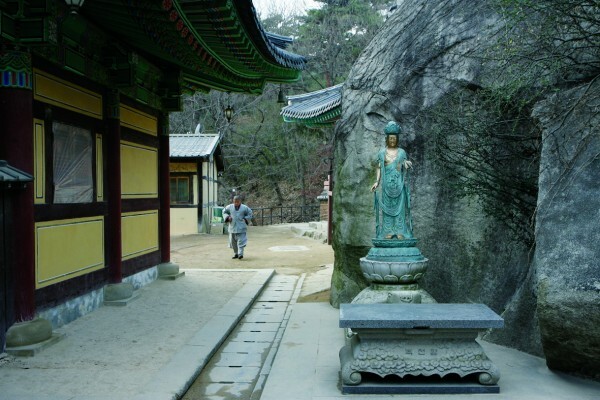 According to the legend, this old temple was supposedly founded by Sudeokgaksi, who was the incarnation of the Avalokiteshvara Bodhisattva during the second year of King Chimryu, the 15th King of the Baekjae Dynasty in the year 358, in the hopes of freeing all sentient beings. Daewoongjeon, or the Main Buddha Hall, national treasure No. 49, is a rare example of ancient architecture from the Goryeo Dynasty, along with Geukrakbojeon of Bongjeonsa Temple in Andong and Myryangsujeon of Buseoksa Temple in Yeongju. 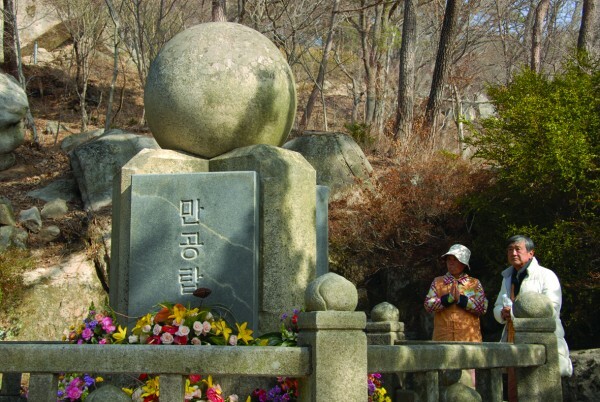 In more recent history, Great Seon Master Gyeongheo (1849-1912) helped revitalize the spirit of the Seon school named Dongbangjaeil Seonwon. Afterwards, his disciple Venerable Mangong (1871-1946) saved the temple during the Japanese Occupation. This temple has played a significant role in keeping Buddhist history alive. This was built in1308, in the 34th year of King Chungnyeol's reign during the Goryeo Dynasty. 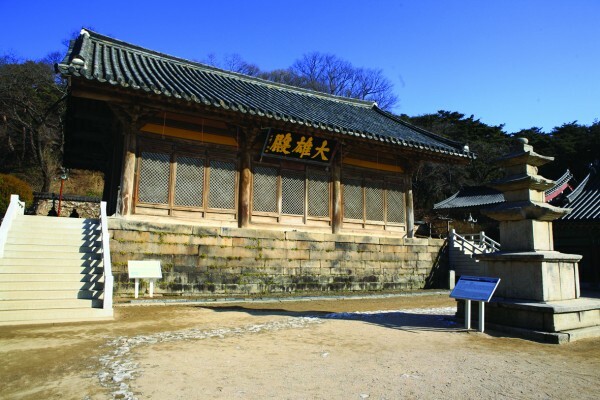 It is the oldest and one of the most beautiful examples of wooden architecture in Korea. Over 700 years of the history can be seen here, yet candles are lit for each yebul, or prayer chant, without the use of any modern conveniences. In particular, the yebul at dawn is so majestic and reverent that you should not pass up this excellent opportunity for self-examination and emptying your mind. The inscription “The world is one flower,” can be seen on the hanging sign board written by Great Seon Master Venerable Mangong(1871-1946). He wrote this when he heard the news of Japan’s surrender. Feeling extremely joyful, he used a Rose of Sharon, the national flower, instead of a calligraphy brush to write this sign. In addition to the signboard, visitors can see the clothes he wore, and the geomungo, or six-stringed Korean zither, which was handed down to him from the royal family of the Joseon Dynasty, and prior to that from the last king of the Goryeo Dynasty, King Gongmin. When you hike up 1,080 steps along the valley, a mountain hermitage called Jeonghaesa, will be with in reach. 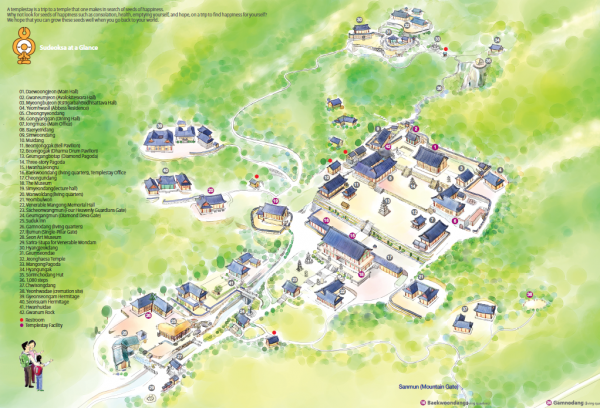 This is a practicing ground called the Neungin Seon Center, which is one of eight Deoksung Chongnim, or training complexes, of the Jogye Order where the head monks of Sudeoksa come together with other practitioners to practice. It is also famous because Venerable Mangong resided here until his last days. The scenery below is just breathtaking and rewards you with the same vast emptiness you are blest with after a deep meditation session. This was a practicing site for Venerable Gyeongheo (1849-1912) and Mangong (1871-1946). It used to be a Seon meditation room but is now used as Jinyounggak, or the Patriarch Hall, for those venerables. At Sudeoksa, truly emptying or clearing your mind means strengthening your power to control all greediness and inequalities in your mind and body. As you look around Sudeoksa, experience the joy of letting go at each moment. This is the mythical rock where Avalokiteshvara, or the Bodhisattva of Compassion, came down as a beautiful lady to build the temple and disappear. It is said that your wish will be heard when you give your sincere prayer to Avalokiteshvara Bodhisattva. Chinese Pea shrubs also grow on the rock, so there are many patrons come to look for them. 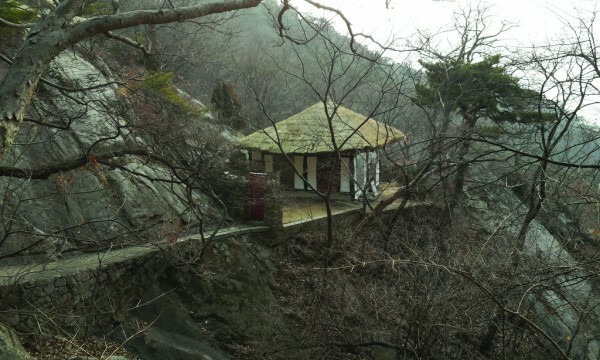 As you walk halfway up the 1080 steps on the way to Jeonghaesa Temple, there is one hut that looks as if it just came out of a book. 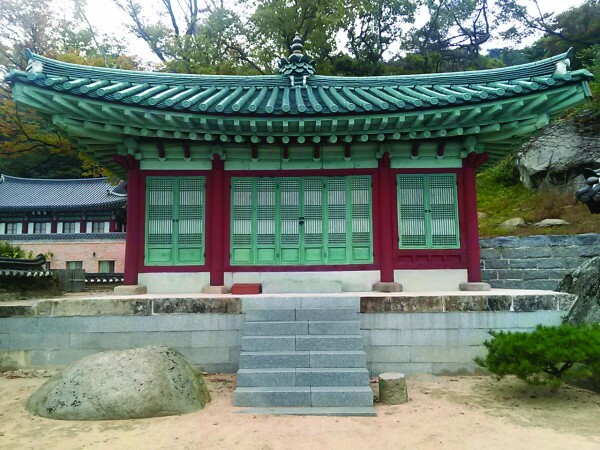 This has been kept in the same condition as it was when Great Seon Master Mangong used to reside there. Even today, some monks still come up here to practice. This pagoda was created to remember the accomplishments of Venerable Mangong (1871~1946). His handwritten work, biography, and teaching were inscribed here. This is the place where the well-known painter Goam (pen name) Eungno Lee (1905-1992) dwelled and worked until he went to France in 1959. The inn was actually run by his wife. Now it has become his memorial hall. The original thatched house was kept up, along with a couple of petroglyphs, or drawings on rock. In addition, the templestay office, Gamnodang was added next to it, so it is a popular destination for nostalgia-seekers.